Iran sanctions: Can Europe really keep doing business with Iran? President Donald Trump is pulling the United States out of the Iran nuclear deal and bringing back harsh economic sanctions. But it's how European governments and companies respond that may matter most. Germany, France and the United Kingdom have vowed to uphold the agreement, setting up a showdown with the Trump administration over trade with Iran. US sanctions would prevent American companies from doing business with Iran. But the US Treasury also plans to enforce "secondary sanctions" that could ensnare European companies including Airbus and Volkswagen. "The United States is a big gorilla on the world stage. We try to not only control our companies, but also try to control what other countries' companies do," said Judith Lee, an international trade lawyer at Gibson Dunn in Washington, DC. Companies caught violating the sanctions could be cut off from the US financial system and targeted with a range of other punishments. "If you're a European company and you continue doing business with Iran, that's the risk you're going to have to take ... the United States could individually take action against you," said Lee. European multinationals struck a cautious note on Wednesday, with many saying they would review the Trump administration's decision and comply with all laws and regulations. Volkswagen (VLKAF), which began exporting cars to Iran last year, said it was "monitoring and reviewing political and economic developments in the region very closely." Airbus (EADSF), which will lose a license needed to sell over 100 jets to Iran, said it was "carefully analyzing the announcement and will be evaluating next steps." Both said they would fully comply with the law. Global companies committed to invest billions in Iran after the United States and other world powers lifted many of their sanctions on the country. In exchange, Iran committed to roll back its nuclear development program. Europe led the charge. The European Union exported nearly €11 billion ($13 billion) in goods to Iran in 2017, a 66% increase from 2015. That's roughly 100 times larger than US exports to Iran the same year. France's Total (TOT) made one of the most high-profile commitments to Iran last year when it signed a $2 billion deal to develop the country's South Pars gas field. European officials said Wednesday that Iran's nuclear deal -- and its economic benefits -- should continue. "We will cooperate with the other parties to ensure that while Iran continues to restrict its nuclear program, then its people will benefit from sanctions relief in accordance with the central bargain of the deal," said UK Foreign Secretary Boris Johnson. Related: Who loses out as US sanctions return? Experts said that the European Union has one unusual option to try to protect trade with Iran, but it's a politically fraught path that would put many firms in legal limbo. They said the EU could use a "blocking regulation" to counteract US sanctions and allow trade to continue. The rule was first introduced in 1996 to protect trade with Cuba. 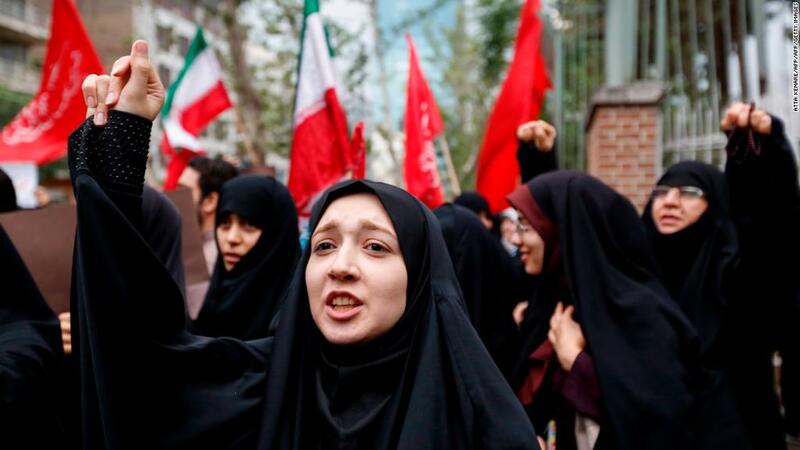 "Not everyone in Europe, especially among European companies, is confident that [this rule would] allow the continuation of business with Iran," said Thomas Gratowski, an Iran expert at the advisory firm Global Counsel. "Its practical value is probably much lower than its symbolic value." Lee, the international trade lawyer, said that European leaders could still attempt the maneuver. "You have to view this within the overall deterioration of the relationship between the United States and Europe [on trade]," she said, noting that using the regulation would be a "significant escalation." Experts say the only truly safe option for European companies is to halt operations in Iran. Richard Grenell, the US Ambassador to Germany, was blunt in his assessment: "German companies doing business in Iran should wind down operations immediately," he said in a tweet. The reaction from Iran was also sour. Supreme Leader Ayatollah Ali Khamenei tweeted that he no longer trusts Britain, France and Germany. "If the government wants to make a contract, they should ask for a guarantee, or else they will all do just as the United States did," he said on Wednesday. -- CNN's Chris Liakos, Nic Robertson, Saskya Vandoorne and Carol Jordan contributed reporting.